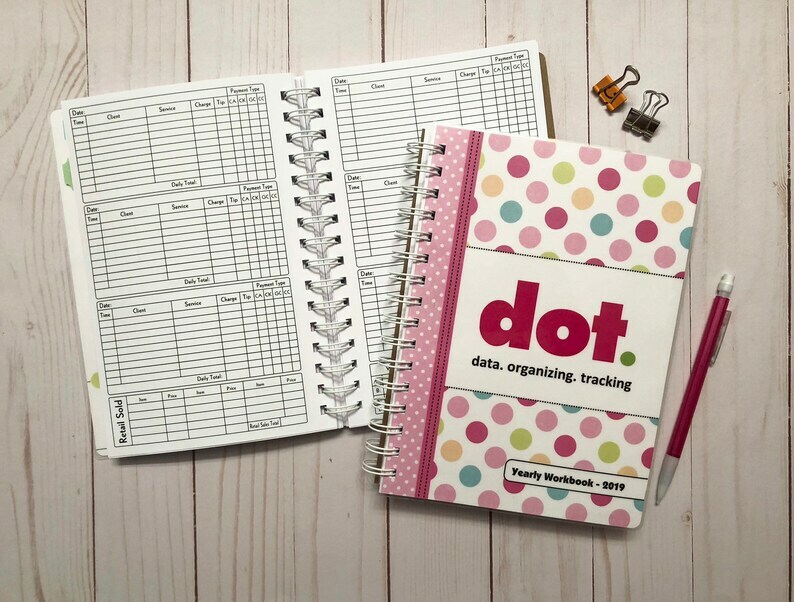 - THE DOT EDITION - features everything you need including a full yearly calendar and planner. •	Includes a Mechanical Pencil and 2 Binder Clips. •	NOTE: *The Schedule section is set up to be used mainly for income tracking. It's not your typical appointment book format, but some people use if for that if it suits their needs. It is broken down by day with spaces to write in each customer, the service they received, how much they paid and tip amount. You can also check off if they paid by cash, check, credit card, etc. - THE ERIN EDITION - is a special edition model and features everything Nail Professionals may need for keeping track of their business. THE PEYTON EDITION – the Peyton Edition is the only version that includes a standard appointment book which is 6 days/week. •	Yearly Appointment Book Section - (6 days a week) with weekly income at bottom*. Time frame is from 8am - 8pm in ¼ hour increments. If you need a different time frame please contact me before ordering. •	This can be customized with your name or company name on the front cover. Leave specific directions in the Notes to Seller section at checkout. •	The book with cover is 6" x 8 1/2" and pages are 5 1/2" x 8 1/2". •	Cover is printed on heavy weight cardstock and laminated with thick plastic. Back cover is chipboard. Pages are 28# bright white laser paper. •	Shipped via Priority Mail. It was exactly what I needed to keep track of my business! Love how it’s personalized. Super fast shipping and love how I will be organized! I absolutely love my new book!It has everything I need and nothing I don't. The customer service is outstanding and it's easy to get it customizied.